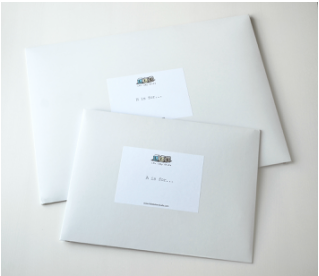 Alphabet prints and bespoke letterpress photographic prints are supplied wrapped in tissue paper and include a complimentary signed and embossed certificate. For protection, they are sent in either a cardboard tube or a board envelope depending upon size. Due to the individual nature of personalised prints, we allow up to 2 hours from the time of your order for you to amend or cancel your order. After this time, we are unfortunately unable to offer a refund or exchange on any Personalised Prints purchased. In the unlikely event that your order is out of stock, we'll offer an exchange for another product or a full refund. Every effort is made to ensure that your goods will arrive in perfect condition. Please contact us within 24 hours of receiving your delivery if an item is damaged in transit. Photographs of any damaged goods may be required, as this will help with any insurance claims with Royal Mail. We are not responsible for return postage or for packages that do not reach us. Please ask for proof of postage if returning any items. Refunds or exchanges will be made to you within 30 days. Refunds will be credited to the original method of payment. All prices exclude delivery costs. All UK orders are dispatched using a tracked and signed for service by Royal Mail or a courier service. A signature will be required upon delivery. For deliveries within the UK, price of postage per board envelope is £2.75 for A4 prints and £4.75 for A3 & A2 prints. Both A4 and A3 prints are sent flat, ready to frame, in board envelopes. Orders are despatched as soon as possible but please allow up to 10-15 working days to receive your order. For deliveries to most European countries including Switzerland, price of postage per board envelope (for A4 prints) or per cardboard tube (for A3 prints) is £6 for standard service or £10.50 for a Signed For service. Orders are despatched as soon as possible but please allow up to 28 working days (depending upon location) to receive your order. For deliveries to the USA and Canada, price of postage per board envelope (for A4 prints) or per cardboard tube (for A3 prints) £8 for standard service or £12.15 for a Signed For service. Orders are despatched as soon as possible but please allow up to 28 working days (depending upon location) to receive your order. For deliveries to all other parts of the world, please contact me for a quote for delivery costs before placing your order. Upon receipt of your order, you will receive an email with an estimate of the final price of your painting and delivery charges, and an outline of ideas for subjects and colours. Once subjects and colours are agreed and before the painting is started, you will receive a final quote for prices and an outline sketch of the composition. Your confirmation is then required for work to start on the painting. Please note that due to the individual nature of each commissioned painting, commissions may take up to 6-8 weeks to complete. As each commissioned painting is unique, we allow up to 2 hours from the time of receiving your confirmation email for you to cancel your order. After this time, if you change your mind about going ahead with your painting commission, a percentage of refund will be given depending upon how far the commission has progressed e.g. if the painting is 75% complete, 25% will be refunded. In all cases, at least 40% of the total commission price will be charged. Full payment (via Paypal) for painting commissions including delivery should be made when you send your confirmation email. For delivery, paintings are wrapped in cellophane and ribbon and include a complimentary gift tag and a signed and embossed certificate. We generally try to recycle packaging materials as much as possible and use bubble wrap / foam pieces to protect your painting within the box. Prices for delivery will be quoted alongside the final price of your painting. All orders are dispatched using a tracked and signed for service by Royal Mail. A signature will be required upon delivery. When your painting is finished, you will receive a confirmation email that it is ready for despatch. Please allow up to 5-7 working days (within United Kingdom) or 15-20 working days (outside of United Kingdom and depending upon location) to receive your order. Every effort is made to ensure that your goods arrive in perfect condition, please contact me within 24 hours of receiving your delivery if an item is damaged in transit. Photographs of any damaged goods may be required, as this will help with any insurance claims with Royal Mail. We are not responsible for return postage or for packages that do not reach us. Please ask for proof of postage if returning any items. All prints and paintings are supplied unframed. Prints are designed to fit standard frames such as Ikea's Ribba range or Micasa's Galleria range (available in Switzerland). All credit card payments are processed through Stripe, the completely secure, online payment processor. All major debit and credit cards are accepted and you don’t have to have a Stripe account to make a payment. We also accept PayPal. For more information about PayPal, please visit www.paypal.co.uk. We keep no record of any of your credit card details.